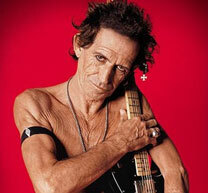 Keith Richards, 64, from Rolling Stone has been asked by doctors to donate his body to medical science when he dies. The doctors are astounded how Richards’ body has been able to withstand decades of drug abuse and want to examine his incredible immune system. been parting a while longer than im old keith is the poster boy leagelizing dope use .but of course there is that crime thing …..